Wikimedia Commons has media related to Warwick Goble. Warwick Goble (22 November 1862 – 22 January 1943) was an illustrator of children's books. He specialized in Japanese and Indian themes. Goble was born in Dalston, north London, the son of a commercial traveller, and educated and trained at the City of London School and the Westminster School of Art. He worked for a printer specializing in chromolithography and contributed to the Pall Mall Gazette and the Westminster Gazette. In the 1890s, he contributed half-tone illustrations to monthly magazines such as Strand Magazine, Pearson's Magazine, and The Boy's Own Paper. In 1893, he was exhibiting at the Royal Academy. In 1896, he began illustrating books. In 1898, he was the first to illustrate H. G. Wells's The War of the Worlds, having illustrated it for Pearson's Magazine in 1897. He briefly continued with scientific romance themes. 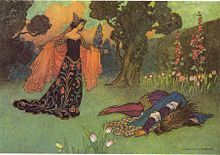 In 1909, he became resident gift book illustrator for MacMillan and produced illustrations for The Water Babies, Green Willow, and Other Japanese Fairy Tales, The Complete Poetical Works of Geoffrey Chaucer, Stories from the Pentamerone, Folk Tales of Bengal, The Fairy Book, and The Book of Fairy Poetry. During World War I, he was employed in the drawing office of Woolrich Arsenal, and volunteered for service with the Red Cross in France. He worked occasionally for New York MacMillan, and produced editions of Treasure Islandand Kidnapped. Goble gradually gave up illustration to pursue sculling, cycling, and travelling. He died in his Surrey home in 1943. Grace Edith Marion James (11 November 1882, Tokyo — 6 February 1965, Rome ) was an English writer of children's literature and a Japanese folklorist. Her Japanese Fairy Tales (1910) collected and retold stories from the Japanese folk tradition. It was illustrated by Warwick Goble.Green Willow and Other Japanese Fairy tales and The Moon Maiden and Other Japanese Fairy Tales are other editions of the original collection. The Three Dwarf Trees is based on a Japanese play. Japan: Recollections and Impressions, a memoir of her experiences in Japan, was first published in 1936.Grace James also wrote the John and Mary children's adventure series, one of which, John and Mary's Aunt, is about the author's upbringing in Japan. Her father Thomas was a British Naval officer, who was a member of one of the Naval Missions which visited Japan (probably the Douglas Mission, as the dates coincide). Her parents went there around 1873 and she was born in Tokyo seven years later (to be followed by a brother and a sister). The family lived in five houses in and around Tokyo during this period, and spent their summers at Nikko, Kamakura and Karuizawa. When Grace was twelve, the whole family moved back to England. "John & Mary's Aunt" & "Japan: Recollections and Impressions"